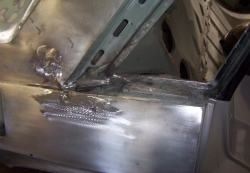 The corner of this door was rusted a new corner was made up the skin however was sound and so was cleaned and treated. 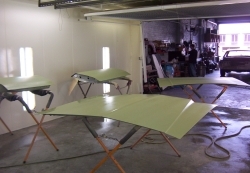 The panels were in very good condition with only a few small blemishes to be repaired they were then deoxodined and primed with epoxy. 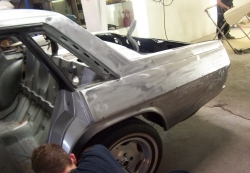 This is the spray polyester being applied to fill in scatches and slight imperfections in the metal. The front end being cleaned. 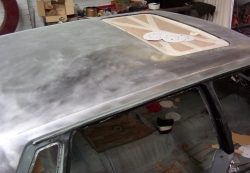 The roof after stripping showing the hole for the aftermarket sunroof. Cleaning the door shuts. 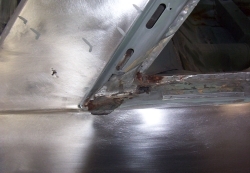 One of only 3 rust affected areas in the body the other side was the same due to water being trapped buy the foam injucted into these cavities in the body. 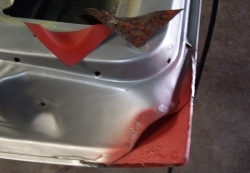 The foam was dug out the area behind cleaned and treated and new sections fitted and ground back all thats left to do here is file up the guard.